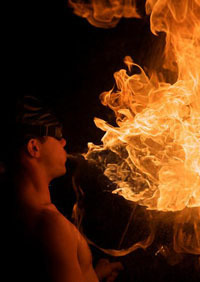 This Fire Artist facilitates fire breathing, fire eating, and many styles of fire spinning in his performance. He has a passion for fire presentation and the creativity and the skill to bring forth innovative ideas into the act, heightening the level of his performance for the audience. He has the tribal, ceremonial, and traditional expertise to provide an exceptional show or facilitate an added splash of entertainment for a Hawaiian Theme. This Fire Artist will take your breath away.